Juventus returned to winning ways in Serie A as they dispatched Sassuolo 3-0 on Sunday evening. It was a nervy start for Juventus and it took some superb goalkeeping from Wojciech Szczesny to ensure that they didn't fall a goal behind, making two excellent saves within the first 15 minutes. Juventus continued to stutter, but they were able to ride out the storm and they opened the scoring midway through the first-half through Sami Khedira. Cristiano Ronaldo's effort could only be palmed into the German's path and he made no mistake from close range. The remainder of the half was relatively uneventful, but the game kicked back into life after the interval when Szczesny almost gifted Sassuolo a goal with an erratic piece of goalkeeping outside of his box, but Domenico Berardi was unable to steer his long-range effort on target. The hosts were made to regret that miss when Ronaldo was on hand to double his side's lead. The Portuguese star rose highest to head home from a Juventus corner, all but sealing the win for the Old Lady. The evening was capped off in style with five minutes left on the clock as Emre Can scored his first Serie A goal of the season, rounding off a flowing move with a confident finish into the bottom corner. 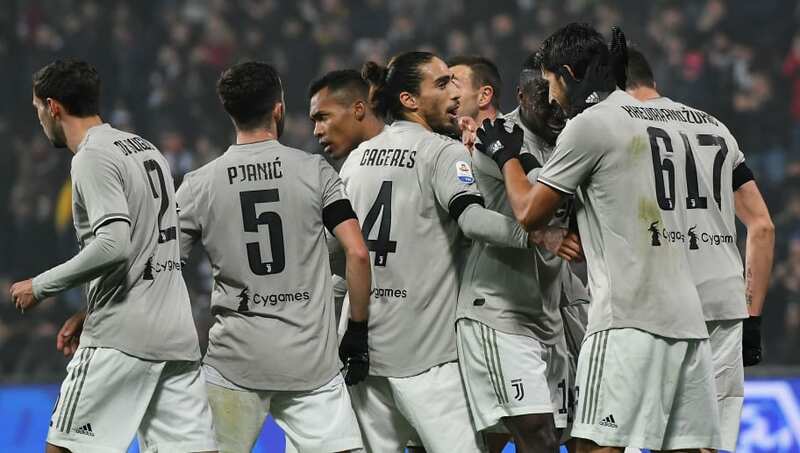 ​Juventus unexpectedly dropped two points against Parma last weekend, so it was important for I Bianconeri to get back to wining ways - especially as the knockout stages of the Champions League are on the horizon. Although they deservedly won the game, there are still plenty of issues that need to be addressed if they are to overcome ​Atletico Madrid next week. They looked rather shaky at the back without Giorgio Chiellini and Leonardo Bonucci and there is often a lack of fluidity to their play in the middle of the park. These have previously been two of Juve's biggest strengths, so there is every chance Max Allegri can iron out the creases before the first leg against Los Colchoneros. Starting XI: Szczesny (7); De Sciglio (6), Rugani (5), Caceres (6), Sandro (6); Pjanic (6), Khedira (6), Matuidi (5); Bernardeschi (5), Ronaldo (7*), Mandzukic (6). Substitutes: Bentancur (6), Dybala (N/A), Can (N/A). It wasn't necessarily a vintage performance from ​Ronaldo, but he did drive Juventus forward in the second half and he played an instrumental role in all three of Juventus' goals. Who would have thought he'd be a success at Juventus? Now Cristiano Ronaldo is the second most assist provider in the league with 7 assists and top scorer in the league with 18 goals. Perhaps harsh when you consider the fact that Juventus kept a clean sheet, but Rugani did make one or two poor mistakes and he was notably shaky on the ball thereafter. Juventus host lowly Frosinone on Friday evening before they play the first leg of their Champions League tie against Atletico Madrid next Wednesday.